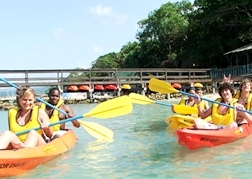 Our Dolphin Encounter program and Dunn's River Falls adventure begins directly from your Montego Bay or Rosehall resort. 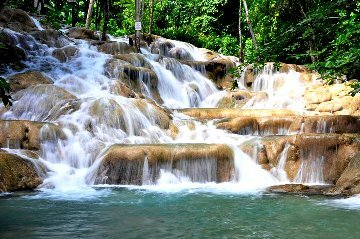 Board your transportation for a scenic ride along jamaica's north coast to Ocho Rios, the shopper's paradise and home to world famous Dunns River Falls. 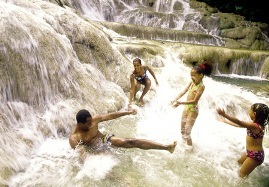 Upon arrival guides are provided to assist you when climbing the falls. For those who do not want to climb the falls, there are adjacent stairs where you can watch the action, take pictures and enjoy the splendor of this natural wonder. 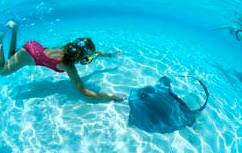 After this invigorating experience you are transported to Dolphin Cove where you are met with a complimentary drink. 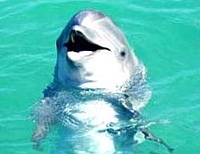 Begin with an interesting and informative presentation, before your amazing personal touch with your dolphin friend! 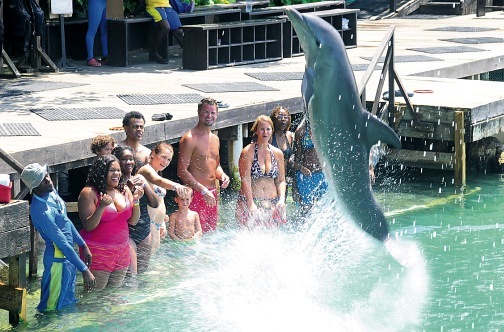 In this 20-minute program, children and adults alike, will enjoy the company of their new dolphin friends in Ocho Rios. Have an encounter with the dolphins in the shallow water (knee deep). Caress and touch the dolphins and view them up close. 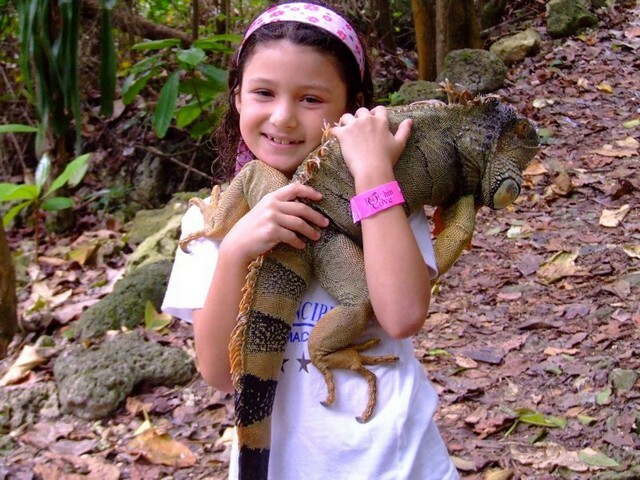 After your dolphin encounter experience, explore the lush tropical forest, which is the home of friendly birds and iguanas. Visit Little Port Royal Village, where pirates roam; view the shark show; see stingrays play; listen to the rhythms of tropical music; or shop for souvenirs. Unfortunately its time and we end it all departing back to your inception for your farewell. 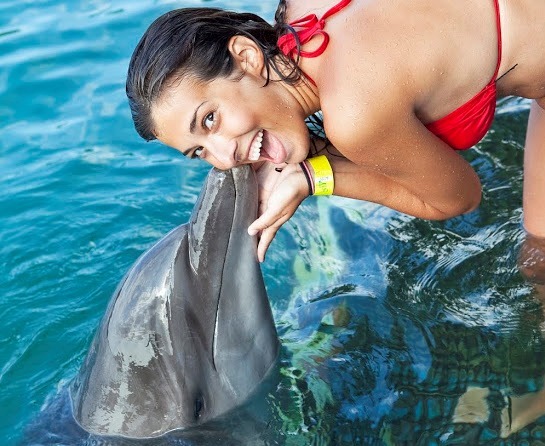 For this one of a kind Dolphin Encounter and Dunn's River Falls adventure, we remind you to bring water shoes, camera, suntan lotion and money for shopping & tips. 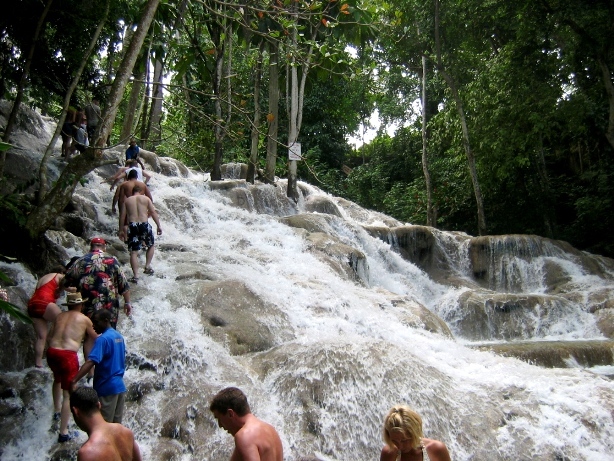 Montego Bay Dolphin Encounter and Dunn's River Falls, tour order may vary! We had an amazing day on our tour. The tour guide was so, wonderful and the driver was excellent. 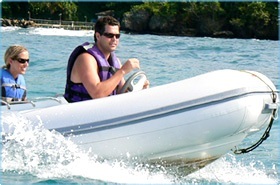 The experience with your tour service was absolutely fantastic from pickup to return. I will recommend your tours to anyone going to Jamaica. Thanks again for a memorable tour. The excursion we booked through you company was Amazing! Everything went smoothly from booking to transportation to the actual excursion. My wife and I are very happy with the service you provided us with. Thank you so much for adding to a really memorable Honeymoon. Thank you for your inquiry. First of all, let me say that I loved that tour in every way. But particularly loved was our guide, Norman. I have been to Jamaica 12 times and have been on many, many tours, but Normal outshone any guide like the brightest star in the sky by far. He had that bus learning just like a teacher...or a preacher! He promised a quiz on the way home and we all paid close attention. He made that bus of strangers into a family and I had such a marvelous time. My only disappointment was that I had bought the Encounter instead of the Dolphin SWIM thinking it was the better one and it was just the opposite. But it was still fun. I would definitely book again with jaital. I love Jamaica and Lord willing, I\'ll be back again!